1 of 2 In a Dutch oven or heavybottomed pot, toss beef cubes with onion, garlic, thyme, flour, 1/2 tsp of the salt and 1/4 tsp of the pepper. Add tomato paste, broth and beer. Cover and bring to a boil. Reduce to a low simmer and cook for 1 hour, until beef is tender. With a slotted spoon, remove beef to a bowl. Increase heat to high, and bring sauce to a boil. Simmer for 10 minutes, until thickened. Stir beef back into sauce, cover and remove from heat. 2 of 2 Meanwhile, add potatoes to a pot and fill with cold water. Bring to a boil and cook for 9 minutes. Stir in cabbage; cook another 3 minutes. Drain and return to pot. Add yogurt and buttermilk. Mash and stir in remaining 1/2 tsp salt and 1/4 tsp pepper. 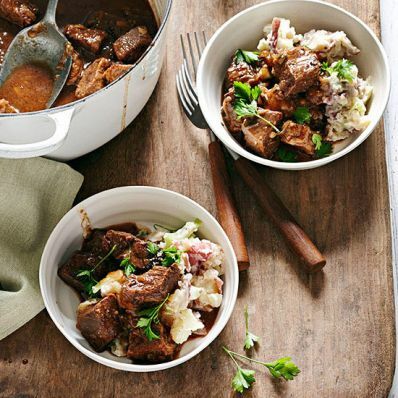 Serve beef over potato-cabbage mash. Garnish with parsley.